Today's card started out as a scrap of patterned paper on my desk and one sheet of my favorite cardstock color - red. I knew I wanted to use the new Die-namics Contempo Cage and Stamp Set from MFT Stamps again. I stamped the perch, a bird and the chain in black Memento ink and then went over each with a black glitter pen. 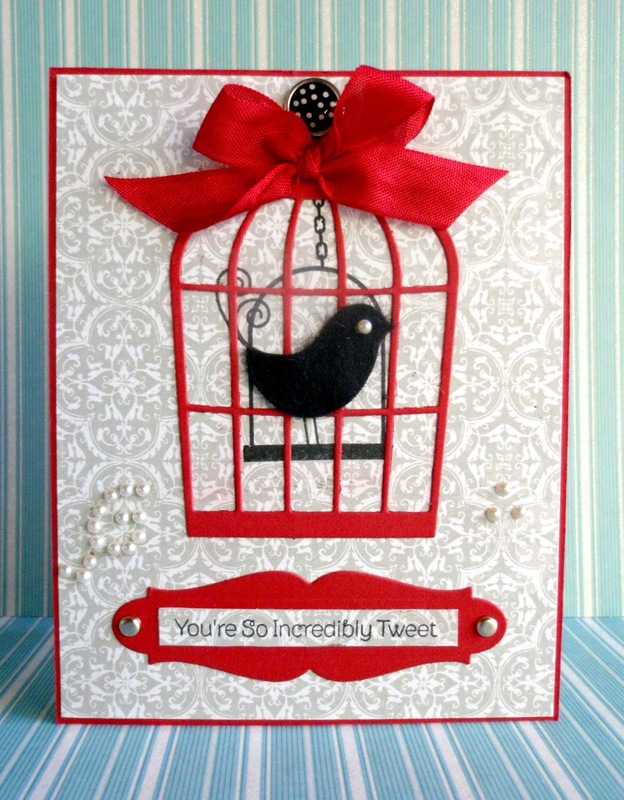 The next step was die cutting my cage from red cardstock and then a little bird from black felt. There was a little more to this bird (his tail), but I snipped it off so you could see the flourish from the stamped bird underneath. The sentiment label is from Spellbinders. I just stamped the sentiment on a scrap of paper and then adhered it on top of the red label. To finish up the card I added some red seam binding, brads and bling. This set of stamps and dies is just so much fun. I can't wait to use it again. When I do, I'll be sure to show you. Tomorrow I will be back with a simple little Trick or Treat card.